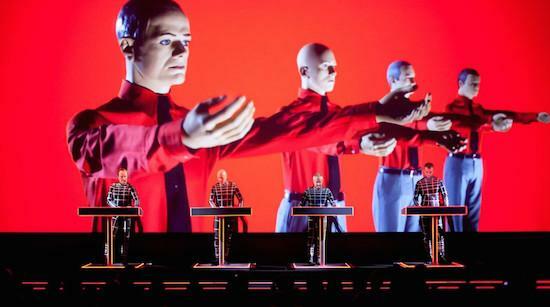 Kraftwerk have announced a new boxset capturing their 3D live show across blu-ray, vinyl, CD and other formats. The boxset takes in eight of the band's classic albums: Autobahn, Radioactivity, Trans Europe Express, The Man-Machine, Computer World, Techno Pop, The Mix and Tour De France. The release marks an upcoming UK tour this June with the boxsets set to be available from May 26. The performances were captured across a number of locations including MoMA (New York), The Tate Modern Turbine Hall (London), Akasaka Blitz (Tokyo), Opera House (Sydney), Norske Opera (Oslo), Paradiso (Amsterdam), Fondation Louis Vuitton (Paris) and Neue National Galerie (Berlin). One of the boxsets will consist of four blu-ray discs and a book. Two of those discs will take in the eight album performances in 3D while the other two will feature tour films and projections in 3D. The vinyl boxset will feature the eight albums across nine pieces of vinyl while the CD boxset will be released across eight discs. There is also a digital download available.